Shock News: UK Recession Over..? Yup, it’s true. The UK recession may actually be over. The National Institute of Economic and Social Research (NIESR) says that the economy hit bottom as long ago now as March this year. There has then been modest growth in April and May. Even the property market shows signs of recovering – with both Nationwide and Halifax reporting about 2 per cent increase in property values last month. First time buyers are still being stuffed for huge deposits, but hang in there folks as the times they are a-changin. No it’s not boom time. So stick with the quality sparkling wine instead of that overpriced Champagne version. It’s just another welcome reminder that reading the daily newspapers makes you depressed! So why not dump the Daily Drudge. 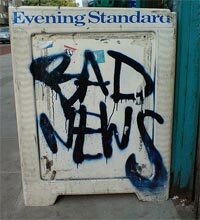 Maybe we should subscribe to Positive News instead.